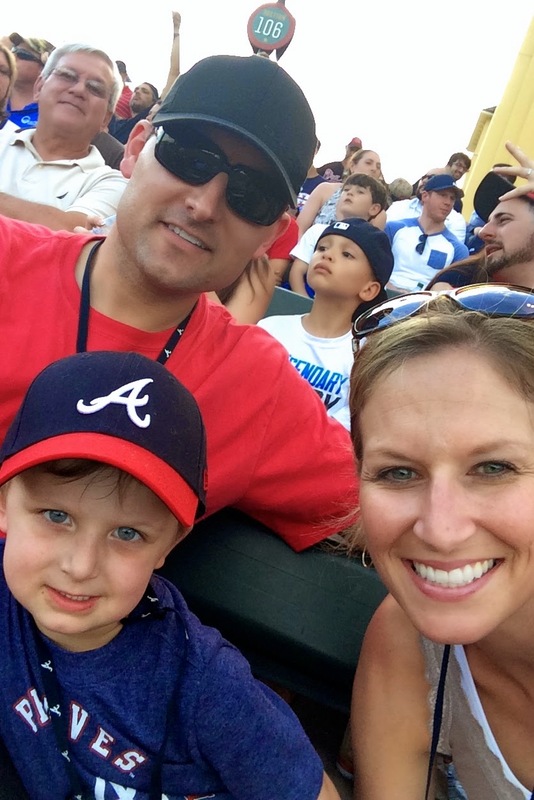 In case you missed it, this week I am sharing all about our recent trip to Orlando, including the Braves Spring Training and Disney! Links to the rest of our trip are below. 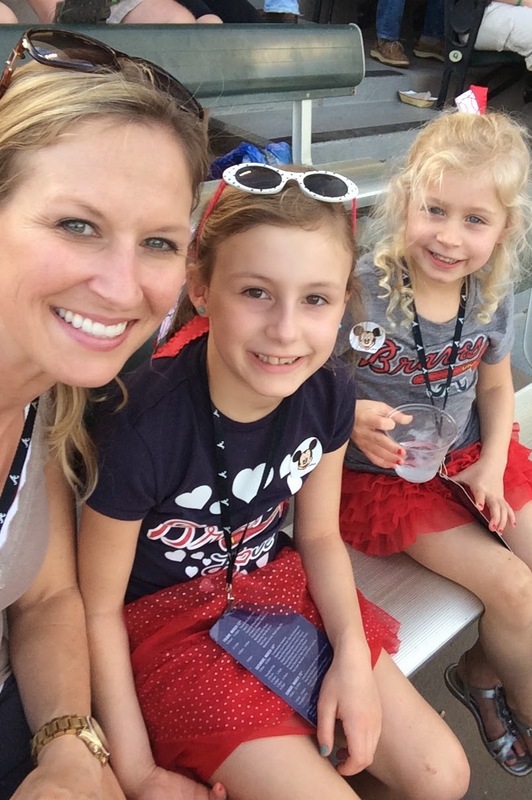 After some quick downtime on Saturday afternoon we got changed and ready to head to the Braves game that evening. Our shuttle took us back to Champion Stadium and we were lead to a pavilion area in the stadium with appetizers, drinks and dinner for all of us. The kids had fun getting their own drinks from the dispensers and I was happy to have some sweet tea! I joked with the Mr. that it tasted SO good because it had been a couple of days since I'd had some. He laughed and said he though I was going to say it had been a couple of weeks. Seriously though, I love my sweet tea and it was so good on that hot evening. It was much needed for him, so we just let him snooze away! Meanwhile, the girls and I had fun exploring a little bit of the park and watching the players warm-up. Before the game began, some of the players came up for an autograph session, which the kids loved! They each got a baseball signed with about 12-15 signatures. They have proudly displayed their baseballs in their rooms at home. It was finally time to eat so we settled in at a table where we could both eat and see the game. Again, they had adorable baseball themed centerpieces. After filling up on hamburgers, hot dogs and all sorts of Mickey Mouse deserts like ice cream bars and rice crispy treats, we found our seats to watch the rest of the game. All three kids loved watching the game, cheering for our team, and enjoying the nice evening (once the sun went down). We had one more day in Orlando, so you can read all about it tomorrow!